A recent study in social psychology conducted at the University of Cologne and London Business School has for the first time shown that social comparison is linked to two fundamental features of human society: tightness, or the strength of social norms and the punishment for deviance from them, and collectivism, or the human tendency to define oneself in relation to others. Dr. Matthew Baldwin from the Social Cognition Center Cologne (SoCCCo) and Professor Dr. Thomas Mussweiler (London Business School) found out that people generally compare themselves more strongly to others in situations of social tightness, in which correct behavior is clearly defined (such as a job interview), or in collective, interdependent social situations (for example at a party). This is the case across individuals, situations and cultures. The results of their series of three representative surveys has now been published in the article, "The culture of social comparison," in the Proceedings of the National Academy of Sciences (PNAS). In the first two studies, conducted online using Amazon's MTurk, Baldwin and Mussweiler surveyed a total of approximately 1.000 Americans. The results showed that people who experience socially tight situations (job interview) and interdependent situations (party) tend to compare themselves more strongly to others. "We noticed that the responses of people who lived many miles away from each other, and did not know each other, were remarkably alike," says Matthew Baldwin. "This means that the link between cultural tightness, interdependence and social comparison is built into the social world, not just a matter of individual perceptions." In a final study, the two psychologists analyzed publicly available data from Google using the online tool Google Correlate. 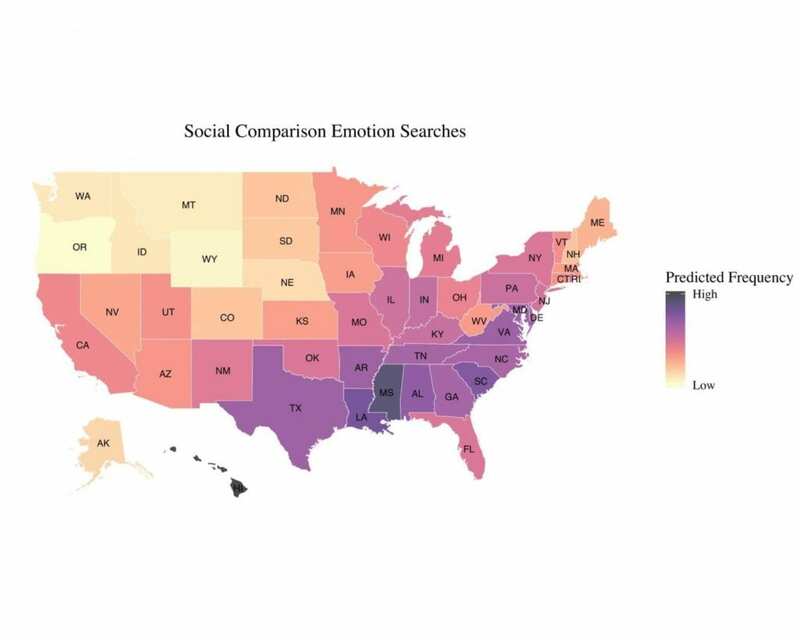 For each state in the USA, they downloaded search frequencies for a variety of emotion words that indicate social comparison (e.g., jealous, pride). A high value for a state shows that people in that state search for the words more than people in other states. The results show that as states become more culturally tight and interdependent, they tend to search for more social comparison emotions. For an interactive map of the researchers' findings across the USA, please see: http://www.mattwbaldwin.com/blog/the-culture-of-social-comparison-map. Scientists still know very little about the relation between social comparison and broad patterns of social life. Baldwin and Mussweiler's study is an important step towards understanding the origins of social comparison and the essential role of comparison for the development of social life.